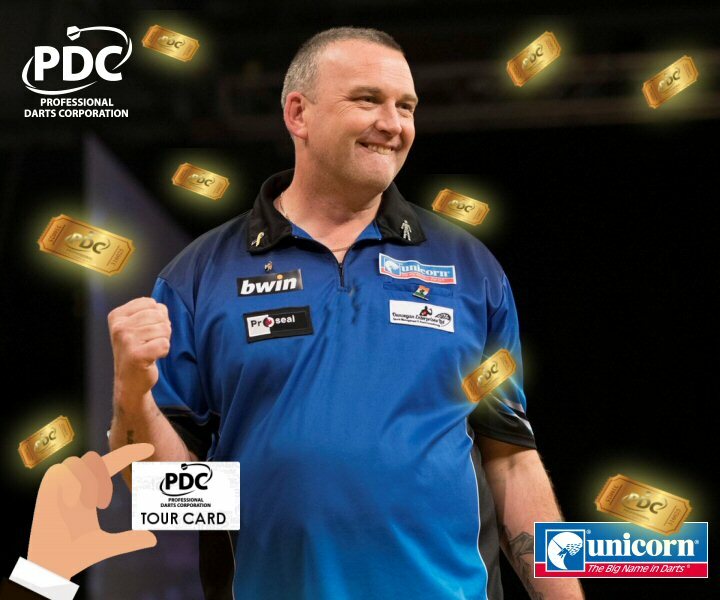 Held over four days, the Professional Darts Corporation’s Q-School gives the chance to any darts player aged 16 or above to win a PDC Tour Card, which allows them to compete on the PDC circuit. Four players of each day can win a two-year Tour Card, with further Cards allocated to other players based on finishing points in the Q School Order of Merit. Participants in this year's competition numbered 397, with 30 of them grabbing a Tour Card. It’s going to be a big year for Mark in 2019 as he recently earned a PDC Tour Card. The former BDO world number one is going to be playing in some of the biggest tournaments in the sport over the next 12 months which makes it an exciting time for him. Mark former BDO number came agonisingly close to winning a Tour Card on the first day of action, suffering defeat in the semi-finals but went one better on Day Two. Mark began with victories over Dave Prins, Scott Dale, Martin Atkins, Andy Chalmers and Mark Hickey to reached the last 16. 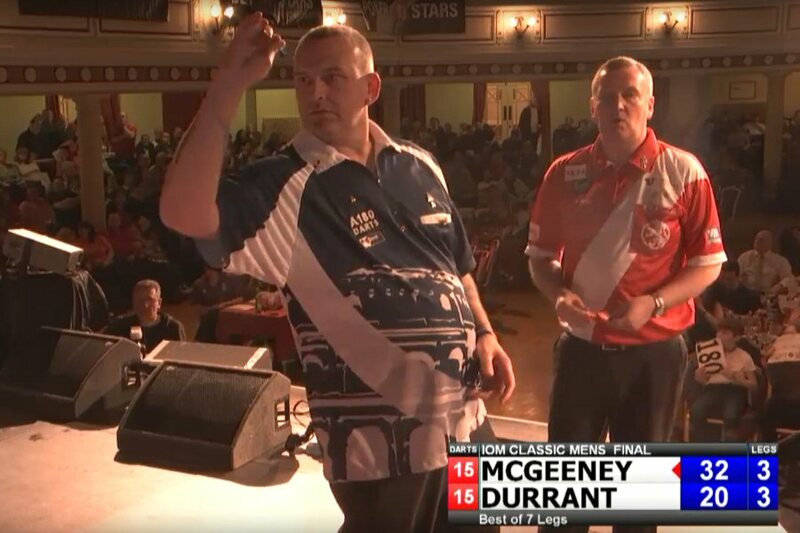 McGeeney then recorded back-to-back 5-2 wins over Matt Clark and Jamie Bain, before edging out Carl Wilkinson 5-4 to attain his all-important Tour Card. 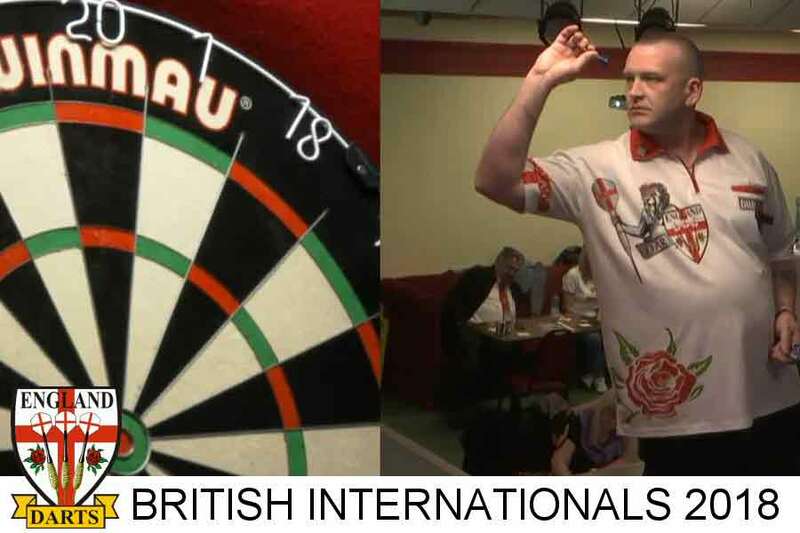 Mark McGeeney, Lakeside World Darts Finalist, two time back to back Dutch Open Champion and England International darts player. Mark is a supporter of Youth Darts and Prostate Cancer UK and many fans will also know he is also a keen Everton Football Club Supporter. Mark’s news Items will appear here so please bookmark and or share this page and website and news item page with others by using one of the quick link share links shown below each on the news entries. Mark was knocked out of the England Darts Organisation (EDO) Classic at Selsey by the eventual winner of the tournament Jim Williams. Full details and links to the tournament event stream can be found on the EDO website. 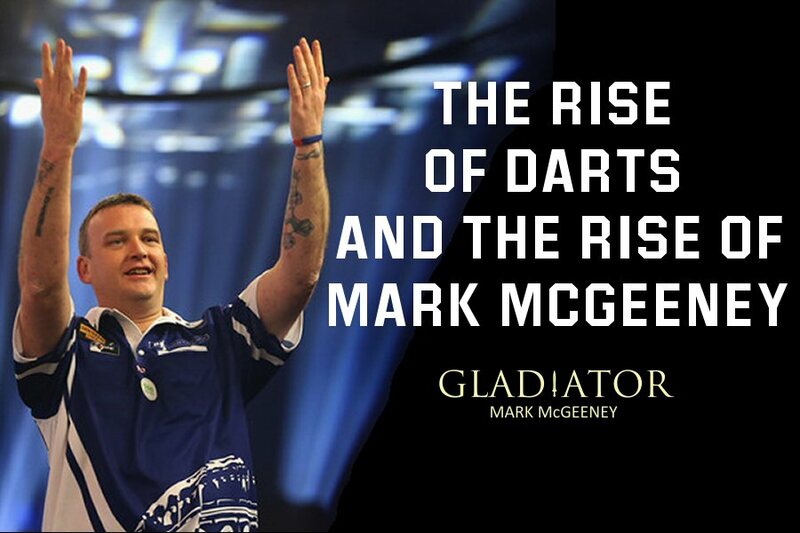 Mark’s fans will know Mark has won the Dutch Open for the last two years and will also recall his narrow defeat in the 2018 BDO Lakeside World Championships to Glen Durrant after having two darts to win the title. 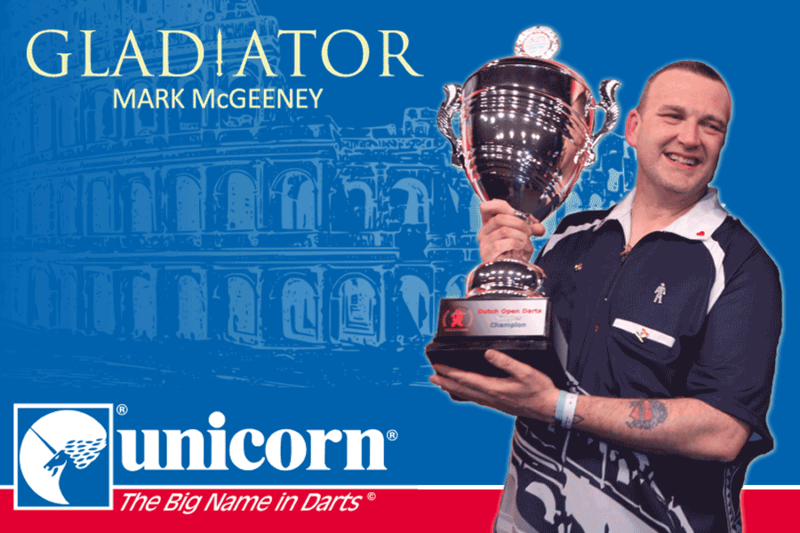 Unicorn has seen Mark’s incredible talent and along with his new management team Dunvegan Enterprisers who also managers dart stars such as Gary Anderson and Micheal Smith have signed Mark to use their precision dart equipment. Mark’s new unicorn darts, flight and stems are now in development and will be available to buy before the end of the year. Mark McGeeney will be feature in the 2018 World Grand Slam of Darts in November and will hoping to see him emulate Scott Waites past experience by winning the event but before that the PDC World Matchplay will cross our screens. 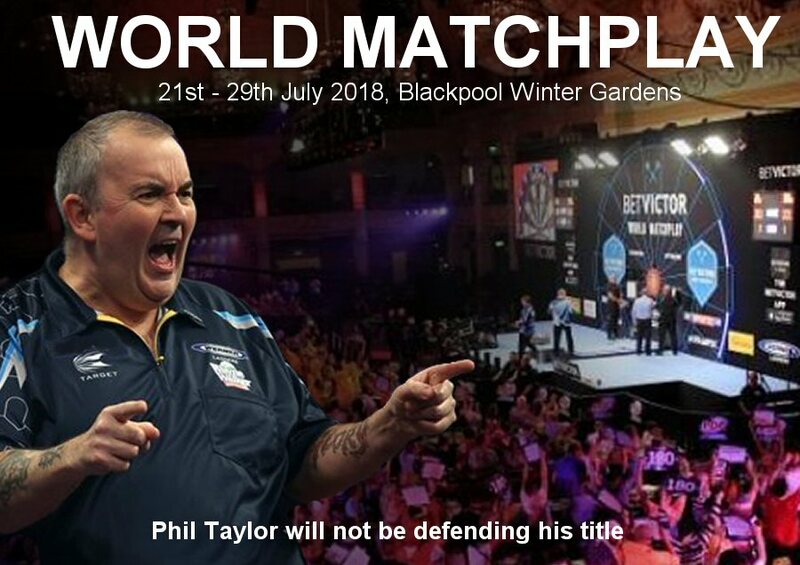 Anyone who knows anything about darts will be aware of the World Matchplay, also known as the BetVictor World Matchplay. This professional darts tournament is played in a ‘legs format’ and has always been run by the PDC – Professional Darts Corporation. The long running and well-established tournament has been played on a yearly basis since 1994. It is held in the Empress Ballroom at the Winter Gardens in Blackpool. This tournament is considered to be the second biggest PDC tournament on the yearly calendar and tickets for the event sell out within days. Following the success of the Lakeside World Professional Darts Championships, comes this season’s next Major, The World Darts Trophy. 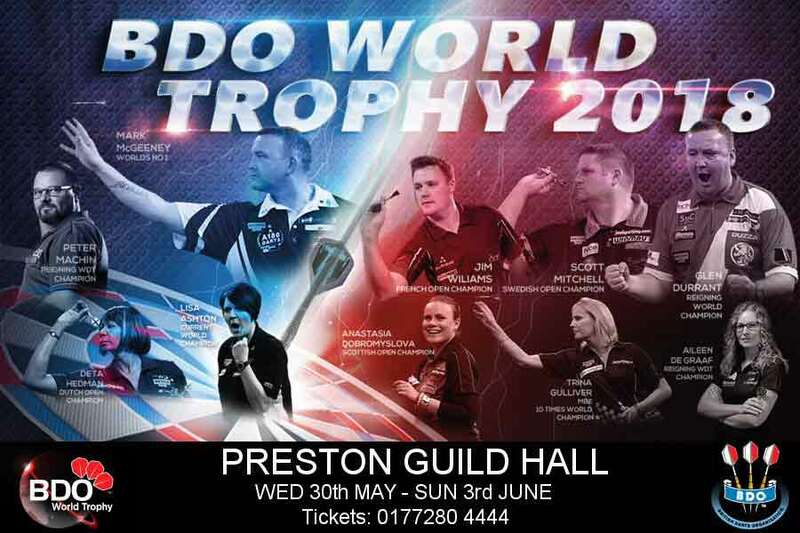 Five days of world class darts comes to Preston Guild Hall this May/June featuring the World’s top 32 men and 16 ladies including Mark McGeeney, Scott Waites, Glen Durrant, Scott Mitchell, Trina Gulliver and Anastasia Dobromyslova. From the 30th May to 3rd June see the World’s top players battle it out for a prize pool of over £50,000. Reigning World Professional Darts Championship winner, Glenn Durrant, 10 times World Ladies champion, Trina Gulliver, BDO No1. Mark McGeeney, Scott Mitchell, 3 x Lakeside World Champion Anastasia Dobromyslova, and local hero Reigning Lakeside World Champion, Lisa Ashton. 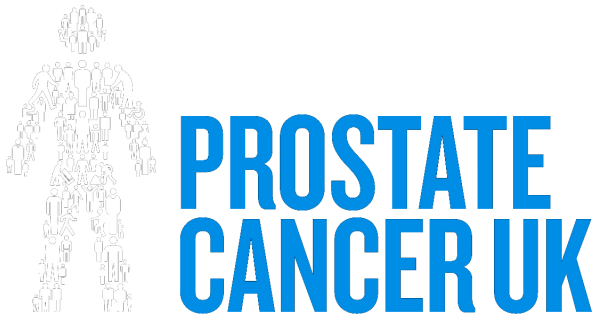 Mark McGeeney helped boost Prostate Cancer UK’s Charity funds on 13th May 2018. Marked tweeted that he would donate £2.00 to the charity for every person who wore a Prostate Cancer UK Team Shirt (PCUK). Lots of you help the cause by wearing your PCUK shirt which delighted Mark and will he will be making a donation of £500.00 to the charity very soon. Marks total was 163 PCUK shirts worn should have been £326 in total but he said he would make it up and donate £500 which has also been matched by Danny who helps run the PCUK stall. £1,000 in total! Mark would like to thank all that took part and if you would like to add to the funds you can donate online by clicking the Prostate Graphic that features on this website and follow the link to donate. Or click on the news graphic below to be taken to the donation page directly. One of the biggest dart events in Germany will take place in a new venue at the Wunderland Kalkar. 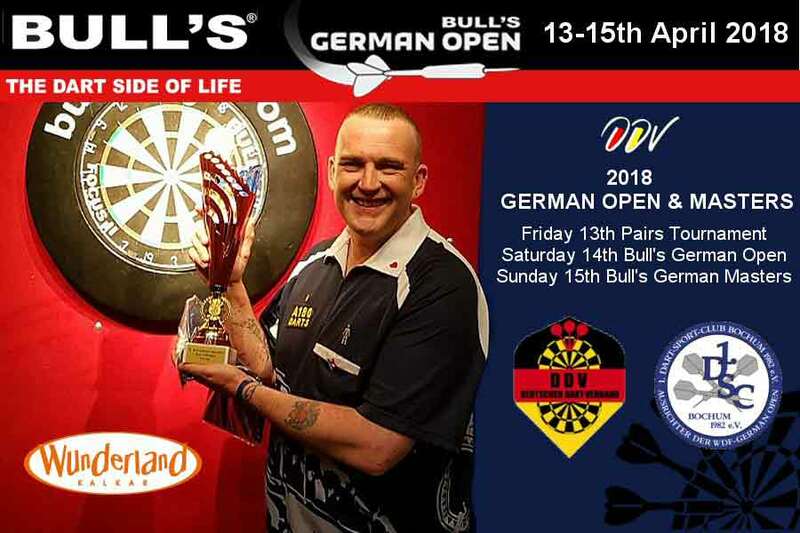 In the Bull’s German Masters Mark made it to the quarter-final stage of the tournament. 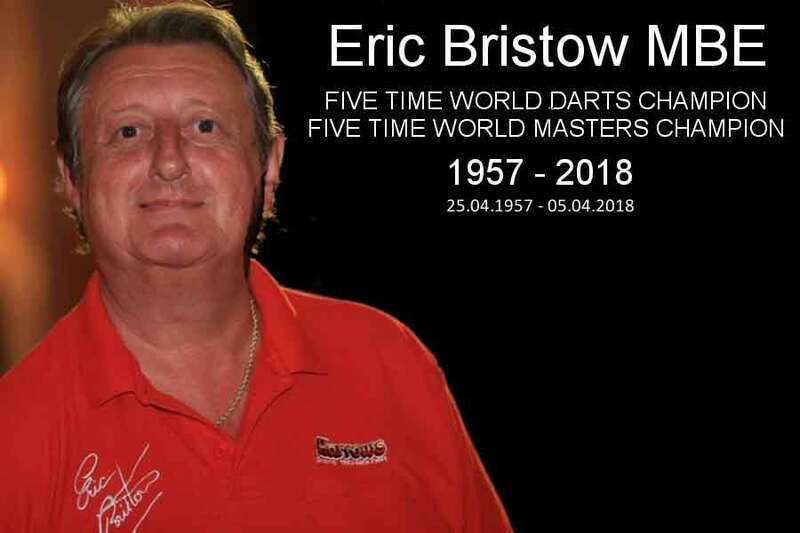 The world of darts has been in mourning since the devasting news of the passing of five-time world champion, Eric Bristow, aged 60. Nicknamed the ‘Crafty Cockney’, Bristow dominated the sport between 1980 and 1986 and picked up another five World Masters titles along the way. Bristow was one of the founding members of the Professional Darts Corporation (PDC) and had been awarded an MBE for his services to the game back in 1989. We would like to add our tribute to one of the greatest darts players that has ever lived. You can replay the event via the YouTube Stream links below. 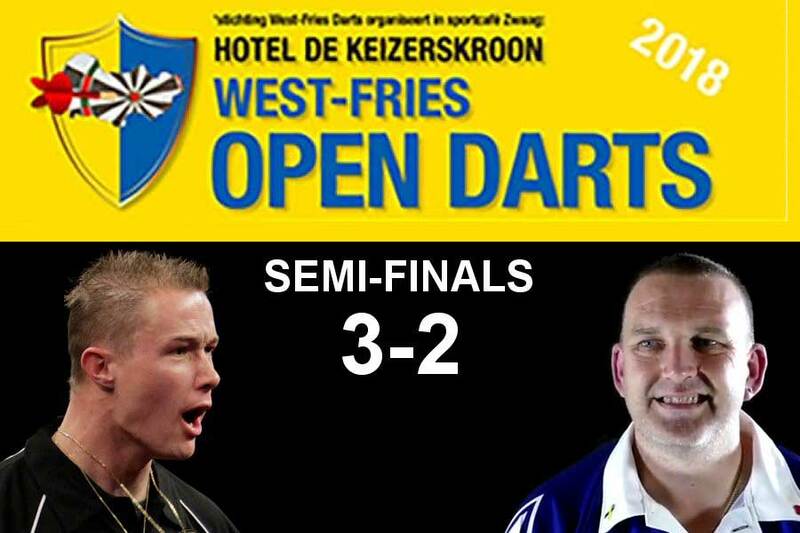 Mark had a tough Semi-final match against Wesley Harms on the west Fires Open in the Netherlands at the weekend. Wesley won the first set 3-1 however, Mark fort back and took the second set with a 3-2. Mark added another darts title at the Isle of Man darts festival by winning the IOM Classic. He faced again the current BDO World Champion Glen Durrant in the final but this time it was Mark who came out on top beating Glen 4-3 in a last leg shootout. View day one of the IOM Darts Festive and Mark’s victory by following the YouTube Link below. The England Selectors are pleased to announce that Mark McGeeney will again represent England in the British Internationals. The event this year will be staged in Wales from the 6th to 8th April. Scott Baker, Daniel Day, Kevin Dowling, Mick Haynes, Nigel Heydon and Conan Whitehead will all be making debuts for their Country. 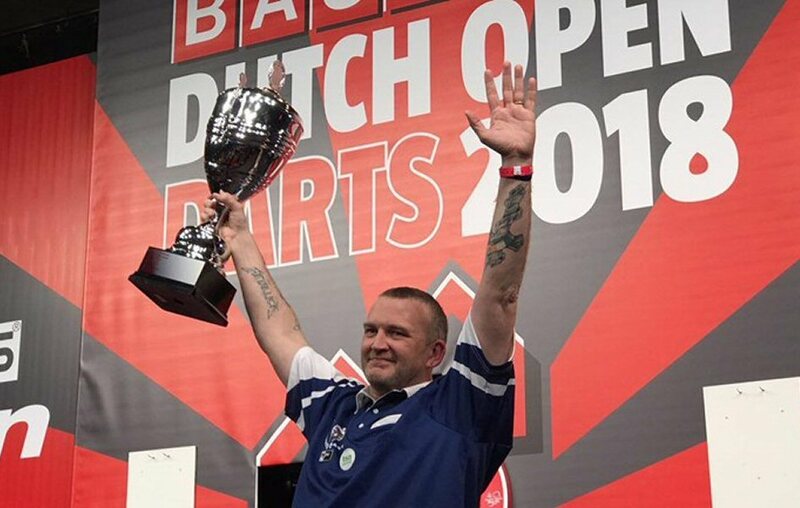 Mark McGeeney successfully defended his BAUHAUS Dutch Open Darts title. 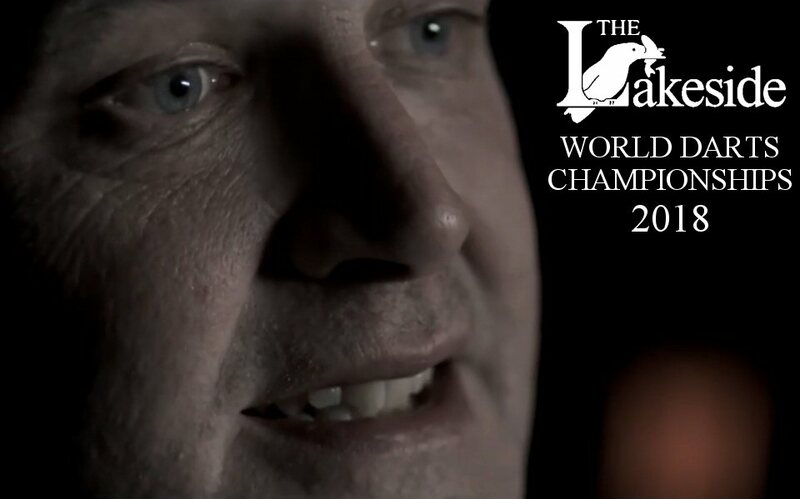 Mark won in a replay of the 2018 Lakeside World Darts Championship final against Glen Durrant. The men's Dutch Open Darts final was a high-level match. Mark started strong and took the first set with 3-1. The second set seemed to go to Durrant after he was 2-0 up, however, Mark battled back and took the set. In the fourth there were four breaks of throw, after which Mark was in a position to throw for the match. He started that leg with a 140, 180 and after two missed match darts, he hit the third making him the winner of the Jilles Vermaat Trophy. Mark, the BDO and WDF No.1 made it to the 2018 Lakeside World Darts Final in January where he faced defending champion and friend Glen Durrant. Glen hadn’t competed in all of the ranking tournaments during 2017. He spent a lot of his time on tour and in exhibition matches. However, Glen was on form and despite Mark having darts at a double to win the World Championships, it was not to be. 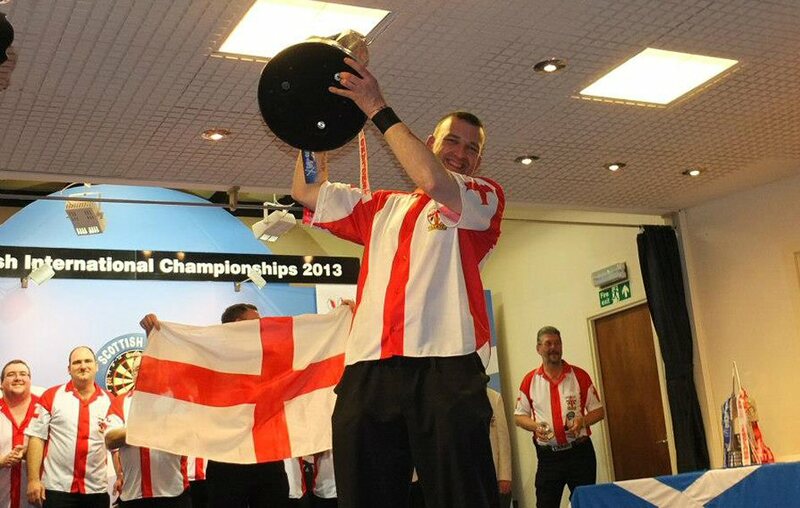 Glen claimed his consecutive Lakeside World title 7-6. Obviously, Mark was gutted not to win but he will be back next year and will be determined to put things right!